A fabric quilt became one of the central icons of the Centennial Olympic Games and the inspiration for the design of the Olympic venues. For the final gallery of the museum, Whirlwind collaborated with Digital Stone Project to make a 3-D scan of the fabric quilt which was then translated into a stone carving on a 6’x 6’slab of Georgia marble. 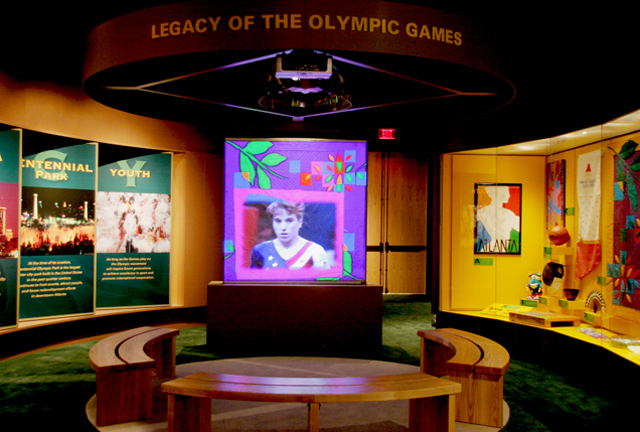 The projected colorful leaves of the quilt align with the carving on the stone and transform into interviews with gold medalists and Olympic organizers reflecting back one decade later on the legacy of the Olympic Games.